One of the hallmarks of IPPNW’s work is engaging with nuclear decision makers about the medical consequences of nuclear war and the urgency of ridding the world of nuclear weapons. In pursuit if this kind of physician diplomacy, IPPNW held a seminar on nuclear disarmament with European Parliamentarians on October 13, 2009 in Brussels. 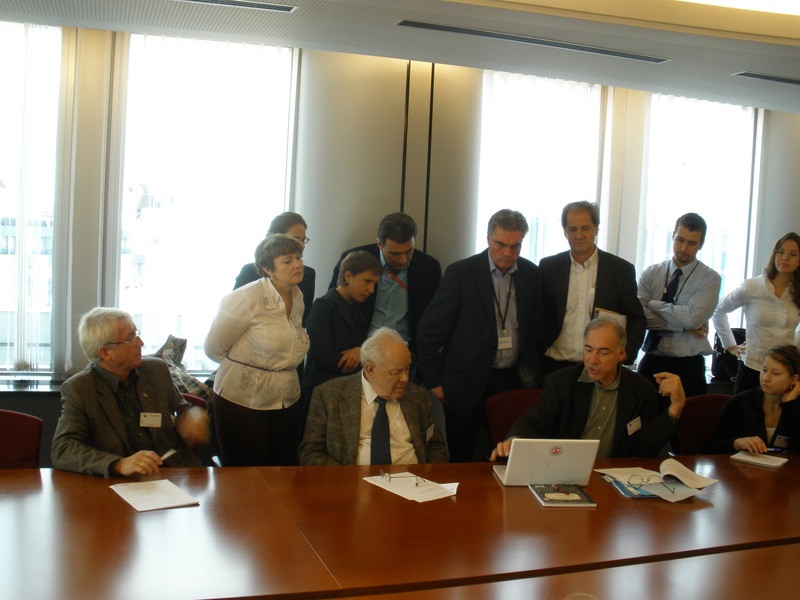 European parliamentarians watch an animation demonstrating the global climate effects of regional nuclear war during an IPPNW seminar in Brussels on October 13. The following day, an IPPNW delegation engaged in a roundtable discussion with NATO nuclear policy makers at NATO headquarters. And on October 15, IPPNW held a dialogue on French nuclear policy at the Ministry of Foreign Affairs in Paris. The goal of the EUP seminar was to explore ways in which the European Parliament might become more actively engaged with the Nuclear Weapons Convention and civil society campaigns for nuclear disarmament, especially in Europe, where the principal issues are the British and French arsenals and the continued presence of US tactical nuclear weapons on bases in NATO member states. One parliamentarian who listened attentively to IPPNW’s presentation on the medical and environmental consequences of regional nuclear war said it was “a wake up call” about the urgency of the nuclear threat. Co-President and Russian Duma member Sergey Kolesnikov spoke about the reductions on the Russian military budget and the new security concept proposed by President Medvedev and endorsed by President Obama at the UN Security Council during the special session on disarmament on 24 September. The seminar helped strengthen IPPNW’s relationships with some key EUP supporters with whom we can work to raise the profile of nuclear disarmament issues among other parliamentarians. We also received further confirmation of the impact of the nuclear famine findings, and the importance of presenting this medical and scientific data to policy makers. The focal point of the NATO meeting was the new NATO Strategic Concept, which will be formulated over the next year. IPPNW explained its position that the remaining US tactical nuclear weapons on the territory of NATO member states should be removed; that the nuclear sharing doctrine should be eliminated from the new strategic concept, and that a denuclearized Europe would contribute to strengthening the NPT and to achieving a world without nuclear weapons. The NATO participants insisted that the alliance strategy would continue to rely on nuclear deterrence. And argued that removing nuclear weapons from Europe would decrease security, while non-proliferation would increase security and was a NATO objective. Dr. Kolesnikov replied that continued reliance on deterrence and nuclear sharing in the new Strategic Concept would create obstacles to improved relations with Russia, which NATO has also declared as an objective. IPPNW will make it a priority over the next several months to lobby the governments of NATO member states about the need to denuclearize NATO’s strategy and to eliminate nuclear weapons from Europe as a step toward a nuclear-weapon-free world. An IPPNW delegation met with the director of the Disarmament and Non-Proliferation Department at the French Ministry of Foreign Affairs one day after the publication in Le Monde of an op-ed piece by a new French “gang of four,” echoing the calls by prominent diplomats and military leaders for the elimination of nuclear weapons. France insists that — more than any other nuclear-weapon state — it has acted on its disarmament obligations by ending nuclear testing, closing and irreversibly dismantling the French test site, and capping the size of the French arsenal at what it calls the “minimum sufficient deterrent.” France echoes the position of the other nuclear-weapon states that non-proliferation is a higher priority than disarmament, and that any talk of a Nuclear Weapons Convention is unrealistic and premature, and that there is a long way to go in US-Russian reductions before France would have any reason to participate in such negotiations. This was a useful meeting in light of the public debate about nuclear weapons that is starting to take place in France, and there are signs that public criticism about its disarmament policies has fueled this recent effort by the government to defend its disarmament record.